Please refer to our stock # jm12 when inquiring. 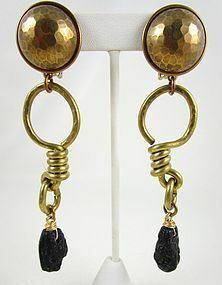 These great statement earrings were designed by San Francisco based designer jeweler, Jan Michaels. Each clip earring is 4 1/4" long x 1" wide, and both are made from brass with Jan's signature "antiqued" finish. The have a wonderful mellow tone accented by genuine lava stones. They have clip back mechanisms and are signed "Jan Michaels San Francisco" on the reverse. Please see my other listings for the matching necklace and bracelet (sold separately).